After-action reports on the Bike MS-150 ARES® communications effort held in October here in northeastern Florida have been released. East Coast District DEC Mike Lee, WB6RTH, said "Crown District DEC Doug Carter, N4FPS, and I cannot stress enough the success that was achieved by all. This was the first inter-district event in the Daytona Beach-Jacksonville area, and it worked as a seamless group of volunteers with a common mission, common training and an outstanding result. In the words of the event organizers, 'this was the best participation from Amateur Radio by far.'" Planning is already underway for next year's event. Lee: "We expect that even more responsibility will be given to radio amateurs in 2011." Lee said they will "do it bigger and better next year" and that he looks "forward to serving with all participants again, starting from the preparations and planning - all the way through game day." Across the country, MS-150 support efforts by amateurs reached a new high water mark in 2010, and there's no reason to believe that it will not continue to rise in 2011. Here is the report from the MS-150 event so that others might gain some insight as they plan their own event participation for next year: 2010 SET Report East Coast - Crown-1. More information and photos here. Congratulations to the northeastern Florida ARES MS-150 communicators on a job well done. Scott, the goal of this column is to provide readers with a slice of life, kind of like a reality show, of our ARES program here in Flagler County, Florida, which is located between historic St. Augustine and famous Daytona Beach on the upper east coast of the state. I suspect that we go through many of the trials and tribulations that most ARES groups experience across the country. Many may identify with us here in what I feel is a typical county ARES program. We suffer the same personality and club dysfunctions, which are part and parcel of all human and organizational behavior, but also share the triumphs and rewards of doing a job well for the public benefit. We have our ups and downs. Other groups may learn from our mistakes and our victories, or at the very least, enjoy an all-knowing chuckle when they see the same thing that happens to them happening to us. Georgia SSB Net Celebrates 50 Years - Tonight! The 12th Annual SKYWARN Recognition Day (SRD) Special Event will take place this Saturday, December 4, 2010. SRD is co-sponsored by the ARRL and the National Weather Service (NWS) as a way to recognize the commitment made by Amateur Radio operators in helping to keep their communities safe. According to SRD Coordinator David Floyd, N5DBZ, Amateur Radio operators can visit their local participating NWS office, working as a team to contact other hams across the world throughout the 24 hour event. In 1999, Meteorologist-in-Charge of the Goodland, Kansas NWS office Scott Mentzer, N0QE, worked with then ARRL Field Services Manager Rick Palm, K1CE, to find a way to recognize the valuable contributions storm spotters make to the National Weather Service. "Since many of those storm spotters were also hams," Floyd told the ARRL, "it seemed like a natural fit for the recognition to be centered on Amateur Radio." With the approval of NWS headquarters and a commitment to participate from many local NWS offices across the country, the first National Weather Service Special Event took place on November 27, 1999. "At the end of the event, almost 16,000 QSOs were logged, with contacts made to all 50 states and 63 countries," Floyd recounted. Floyd said that feedback from that first event was "overwhelmingly positive" from both the NWS staff and the local ham clubs: "Many local club members who came to that first event had never visited an NWS office before. When they came for the special event, they learned the value of their reports and how they were used in conjunction with existing technology." And so began an annual tradition. 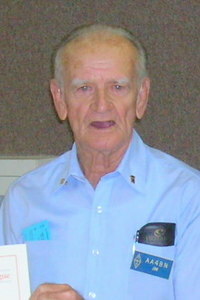 In 2001, the name of the event was changed to SKYWARN Recognition Day, a name Floyd said better conveyed what the day was all about: "Each year since the inception of SRD, the number of NWS offices participating with local ham clubs has increased; more than 100 offices sign up each year to take part. Station call signs have also changed over the years. Floyd said that some NWS offices and clubs apply for a special event call sign, "such as W3B in Brownsville or N0Y in Aberdeen, South Dakota. Other call signs hint at office location, including WX9GRB in Green Bay and WX4NHC at the National Hurricane Center. Still others represent more of the big picture, as in KC0SKY in Pleasant Hill, Missouri." Floyd has seen a greater use of digital communications in addition to CW, RTTY and packet radio: "Each year, more and more contacts are being made using EchoLink, Winlink and the use of e-mail reflectors." In keeping with the NWS setting, stations are asked to include a weather report of their location in their exchange. 2010 SKYWARN Recognition Day will be held on December 4 from 0000 UTC-2400 UTC. Even if you make just one QSO to an NWS office, you are eligible to receive a certificate. Just submit a list of the station(s) you worked (along with a self-addressed stamped envelope) to SKYWARN Recognition Day, 920 Armory Rd, Goodland, KS 67735. Many NWS offices also send out special QSL cards for this event. If you haven't yet joined in the fun of SKYWARN Recognition Day, make 2010 your year to do so! received special commendations from Admiral William Halsey for his radio communications expertise, as well as medals for his service in the Pacific Theater during the war. In 2006, Texas Executive Order RP57 created mobile rapid response task force teams and placed the Texas Department of Public Safety (TDPS) in charge of command, control and communications. There are now three light teams and one heavy team. Dallas, Waco and Austin are the light team staging areas while the heavy team stages in San Antonio. Each team takes its name from its staging location. The Texas Division of Emergency Management (TDEM) created a Communications Coordinating Group (CCG) as part of the statewide response plan. Under this group, Amateur Radio "Communicators" have been given a role in the response plan. The teams will each have Amateur Radio Communicators from the Military Auxiliary Radio Service, State RACES and local ARES/RACES groups. Each group has an assignment in the response plan. The CCG operates from Austin and coordinates the communications needs of the task forces. There are Amateur Radio coordinators assigned to work in the CCG to direct the response of the Amateur Radio Communicators required by the task force. There is a coordinator for each element of the Amateur Radio response. MARS, State RACES and ARES/RACES each have a coordinator. The ARES/RACES element is coordinated by the ARES Emergency Coordinator. The RRTF Dallas and RRTF Waco are comprised of personnel and equipment from around North and West Texas Regions, Texas Military Forces, Department of Public Safety, major telecommunications providers and FEMA. These are professionals from a variety of disciplines. All phases of task force operations are guided by ICS and NIMS protocols. Task Force Amateur Radio Communicators are fully equipped and capable of providing support required for the mission task at hand. Each amateur is self sufficient for the first 36+ hours and has the tools and equipment to support the various modes needed in support of the task force. MARS operators are embedded and support the Texas State Military Forces; Texas State RACES supports the State Operating Center (SOC) and Disaster District Offices; and ARES/RACES supports the task force, local government and served agencies in the affected area as well as backing each other. The ARES/RACES element is comprised of radio amateurs from local ARES and RACES groups and operate as a united ARES element. In addition, the TF Amateur Radio Communicator may be required to use new equipment and modes, assist other agencies, and take additional training and upgrade their medical profile. Between 120 and 72 hours before landfall Pre-Deployment activities begin. At 48 hours before landfall deploy to staging area. Self supporting for 36 hours. At 24 hours before landfall deploy convoy operations. Operations Activity (Duration is incident dependent). The Amateur Radio Communicator intake form can be found at: Task Force EmCom Responder Form. A list of frequently Asked Questions can be found here: Dallas - RRTF F.A.Q. The TF Communicator Documents can be found here: Task Force Documents -- permission for publication from John Galvin, N5TIM, who reports that the above information is for the North Texas Section team. In the South Texas Section Jim Russell, NQ5L is the lead and for the CCG, Glen Reid, K5FX is the overall coordinator. The Radio Society of Great Britain is the IARU Region 1 member-society. The RSGB recently signed a "parity of esteem" agreement with The Radio Amateurs' Emergency Network (RAYNET), the UK's emcomm group. RAYNET is a national voluntary communications service provided for the community by licensed radio amateurs. Formed in 1953 following severe coastal flooding, it now has 2,000 members who provide communication assistance for hundreds of events each year. From its Web site: RAYNET offers a unique range of emergency communication services to user services. Coupled with members' endless resourcefulness, RAYNET is regarded as a professional support organization by both the statutory and volunteer emergency service organizations. Concerning last month's "View from Flagler County," here in Portage County, Ohio, our RACES operation fits the same bill as the FEMV. Three years ago our EMA director asked me to start the RACES program. It took a lot of work, including working through an interim EMA director, getting a plan approved by the county commissioners, and then getting the program running under the newly hired director. We presently have 18 active RACES members. We meet monthly, have true training nets every other week, and hold quarterly drills/exercises. All members have completed background checks and are required to take the FEMA ICS 100, 200, 700 and 800 courses plus the ARRL's Level I emcomm course. Our Assistant EMA Director truly had the vision for how he could make the fullest use of our members, realizing that the EMA had a critical need for support. Like most EMA's, they have no real support staff. There are only the Director, Assistant Director, and an administrative assistant. We have supported a Volunteer Reception Center, trained for H1N1 anti-viral vaccine distribution, and, most importantly, been put to use running the EMA's mobile command post, a fully functioning communication center containing communication gear for all local, regional and state agencies. We had the opportunity to provide supportive communications for Operation Talon Shield in August. This was the largest multi-agency training exercise ever held in Ohio, involving local, regional, state and federal assets plus the Ohio National Guard. The Ohio EMA After-Action Report gave the communications team an excellent review. I had the privilege of serving as COML for the exercise and participate on the county's Incident Management Team. The EMA upgraded its radio room with new Amateur Radio gear. They offer us training opportunities, plus 24/7 access to the EOC and the Mobile Command Post. We interact with police, fire and county hospital staff and demonstrate our capabilities to them, and, most importantly, we have been able to maintain the relevancy of ham radio volunteers. It is a harsh reality, but there is not the same demand for purely ham radio operations as there has been in the past. IC-213. There is no option to deliver such a message by ARRL radiogram or any other transcribed message. Nominations are open for the 2010 ARRL International Humanitarian Award. The award is conferred upon an amateur or amateurs who demonstrate devotion to human welfare, peace and international understanding through Amateur Radio. The League established the annual prize to recognize Amateur Radio operators who have used ham radio to provide extraordinary service to others in times of crisis or disaster. A committee appointed by the League's President recommends the award recipient(s) to the ARRL Board, which makes the final decision. The committee is now accepting nominations from Amateur Radio, governmental or other organizations that have benefited from extraordinary service rendered by an Amateur Radio operator or group. The ARRL International Humanitarian Award recognizes Amateur Radio's unique role in international communication and the assistance amateurs regularly provide to people in need. Nominations should include a summary of the nominee's actions that qualify the individual (or individuals) for this award, plus verifying statements from at least two people having first-hand knowledge of the events warranting the nomination. These statements may be from an official of a group (for example, the American Red Cross, The Salvation Army or a local or state emergency management official) that benefited from the nominee's particular Amateur Radio contribution. Nominations should include the names and addresses of all references. All nominations and supporting materials for the 2010 ARRL International Humanitarian Award must be submitted in writing in English to ARRL International Humanitarian Award, 225 Main St, Newington, CT 06111 USA. Nomination submissions are due by December 31, 2010. While no award was conferred in 2009, the 2008 ARRL Humanitarian Award was given to the Amateur Radio operators of the Sichuan Radio Sports Association, the Chinese Radio Sports Association (CRSA) -- that country's IARU Member-Society -- and the many Amateur Radio operators in China who assisted with communications support in the aftermath of the May 2008 earthquake in the Wenchuan area of China's Sichuan province. In conferring the award, the committee noted that the hams' "immediate actions and use of Amateur Radio rendered assistance to victims" of the earthquake and the "long-term relief operation mounted by these organizations exemplifies the highest level of dedication to public service." We've been answering a number of inquires related to the transition from the existing Emergency Communications (AREC) Level 1 course to the revised course which will be called "Introduction to Emergency Communications." The new course is expected to be released online on a new online platform in early 2011. The last registrations for the current online Level 1 course were accepted in July 2010 to allow time for students to complete the course before the old online platform was retired. However, field instruction and exams for the Level 1 course will continue to be supported through December 31, 2010. We expect to beta test the new course on the new platform in January 2011 and release it for enrollment shortly thereafter. We plan to produce course books for the new course after we've had time to receive feedback on the new course content. We expect the new course books will be available by mid-year. Please review the FAQ's posted on our website at http://www.arrl.org/cep-news-and-announcements for specific information about how this transition will affect those who have supporting roles for the AREC program, including EmComm Mentors, Field Instructors and Field Examiners. The 2010 hurricane season ended yesterday, November 30. It was a busy season, but no hurricanes struck the U.S. mainland. We were just lucky. The insidious danger of a quiet season here is the development of complacency. We cannot allow that to happen. The off-season is the time to re-double your efforts on preparedness both personally and organizationally at all levels. Train, exercise, and attend the numerous hurricane conferences that occur early next year. Look at the trends in NIMS/ICS training and protocols, emergency management both at the local and State levels, and adapt your personal and local ARES planning accordingly. Believe me, it won't seem long before we are all staring down the throat of the 2011 hurricane season, when we might not be as lucky as we were this year.